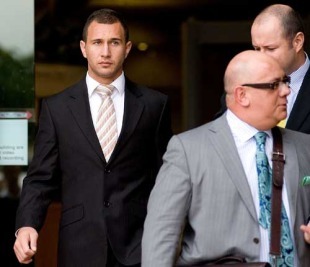 Quade Cooper briefly appeared at Southport Magistrates' Court on Friday for a committal hearing on burglary charges, with his case adjourned until September 17. The 22-year-old Wallaby fly-half was involved in a series of disciplinary problems prior to his arrest, culminating with the burglary charges following an incident on the Gold Coast in December. Cooper was cleared to play in this season's Super 14 by the Queensland and Australian unions despite charges hanging over his head and promptly won the Australian Super 14 Player of the Year award before nailing down a place as the Wallabies' first-choice fly-half. The adjournment was requested by both both defence and prosecution and was granted, with Cooper's lawyer, Dan McManus, deeming it inappropriate to comment. Cooper has been excused from attending the second hearing in September.